This has been a big week for Disney Interactive with the release of Disney Infinity. If you haven’t heard of it, Disney Infinity is an interactive video game that utilize figures for game play. Think of Skylanders meets Minecraft meets Vinylmation. It’s not cheap either; the game and starter pack is $75. The individual figures run about $12 and open up additional characters to play with. Playsets run about $35 and open new worlds. It’s expected that each new movie release with coincide with a Disney Infinity playset. There’s one more element that’s pretty neat, and sure to make wallets lighter, unmarked power disk packs. These give additional weapons, vehicles and other boosts in the game. You never know which boost you’ll get in the packs, and there’s already lots of people setting up trades. The power disk packs run about $5 and come two in package. Some are rarer than others. I’m usually not one to get caught up in these types of things, but once we started seeing how much fun others were having it was hard not to take part. So, we cashed in some gift cards, and I’m eagerly waiting for the game to come in the mail. Hubby and I (who is a game enthusiast, to say the least) have already been around town trying to pick up the various figures, playsets and power disk packs. The mail can’t come fast enough, and when it does I’ll be sure to post a review. Club Penguin is an online virtual world for families. It prides itself on being safe and appropriate for all audiences. Some elements are free, but to get to the good stuff there is a subscription fee. 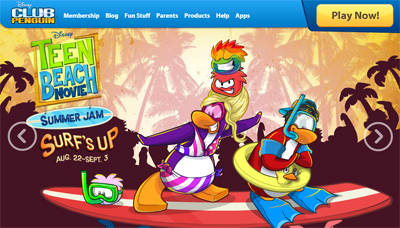 From now until Sept. 3rd, kids can jam with characters from the Teen Beach Movie, which is the latest sensation to come from the Disney Channel.